A goddess, an angel, a contemporary abstract... whatever you see in this stylized pendant it will guard you with beauty and grace. 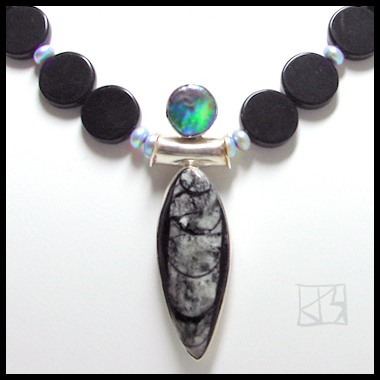 The body of this large artisan piece (68mm x 20mm) is carved from gorgeous orthoceras fossil rock -- slender, elongate shells, remnants of the Paleozoic era 1.5 million years ago -- embedded in a thick bezel of sterling silver, topped with an iridescent peacock pearl coin. 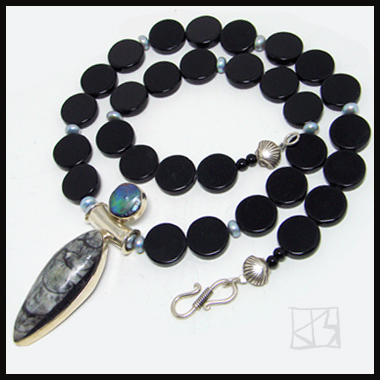 I've suspended it from a 22-23" strand of echoing black onyx coin-shaped beads accented with silvery-blue pearls for balance. The clasp is a rope design s-hook of Bali silver.